I decided to take the bike beyond the spanking new Derry Bridge (quite awkward to negotiate with my heavy alu-framed mountain bike) and to pick my way across the boggy plain, on foot. I got back on the bike when I reached the path which since I was last on it (in 2002!) has been upgraded with beautiful stone clad culverts - very beautiful although a bit intimidating at first! When I reached the woodlands in the bend in the Lui Water, I felt I'd had enough cycling and it was time to support my own weight. A good decision as then the track is rutted for a short distance and then becomes sandy! I took the risk to ford rather than add distance to get to the bridge over the Luibeg Burn and it was another good decision! In fact the day was full of good decisions! 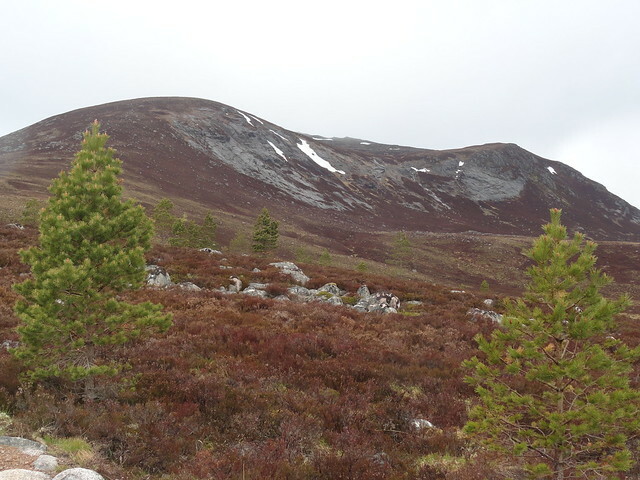 Here the ascent proper really starts and the path to Carn a'Mhaim is soon reached. 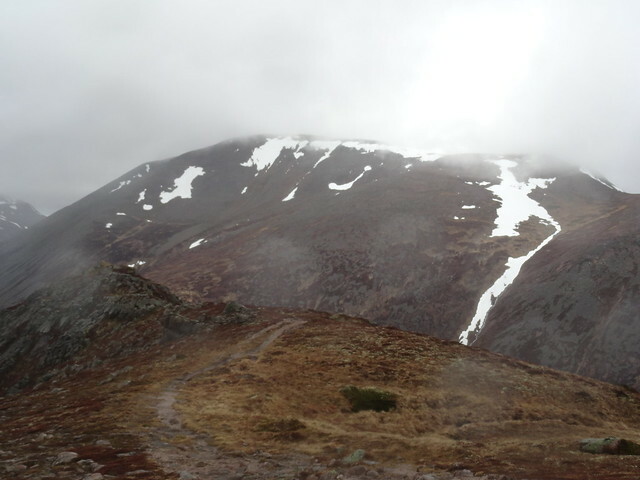 It's an easy climb and as I contoured Coire na Poite, the vista across to Devil's Point, Cairn Toul and the Lairig Ghru opened up. 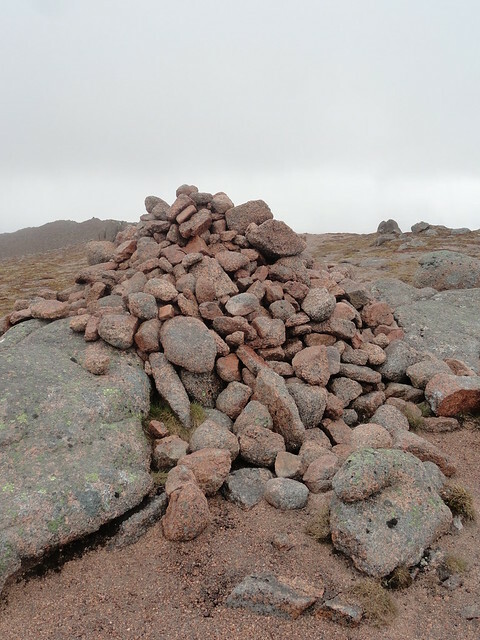 I reached the summit and after the customary laying of the stone on the cairn to mark my accomplishment I made another good decision: to stay high rather than go back the way I came. 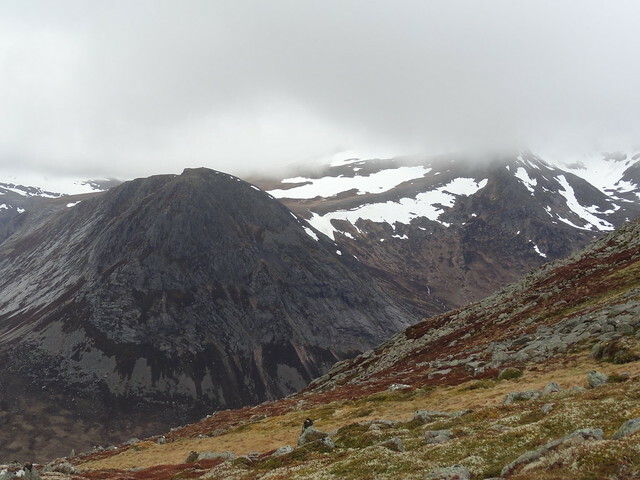 The wind was gusting and the clouds were swirling about but the ridge stayed clear. The only challenge was to stay upright! After a damp lunch huddled behind a gaggle of rocks, I remerged with dry gloves, my hood up and my camera poised. 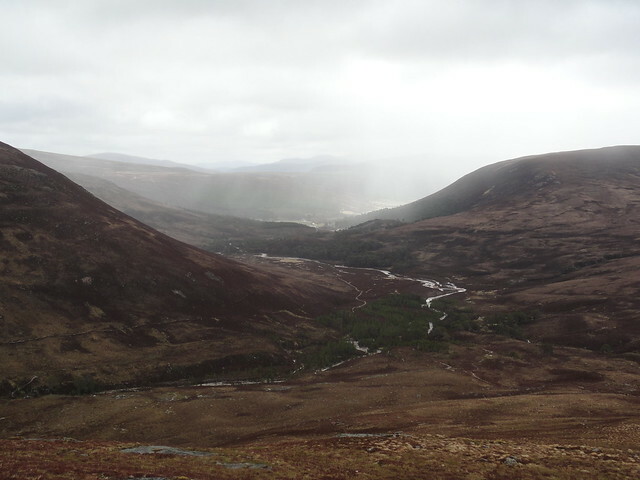 I fought against the wind to stay close to the edge of the ridge and admire the young Dee as it traces its meanders in the silt of the Lairig Ghru. It really does look like glacial water, really primeval and pristine. 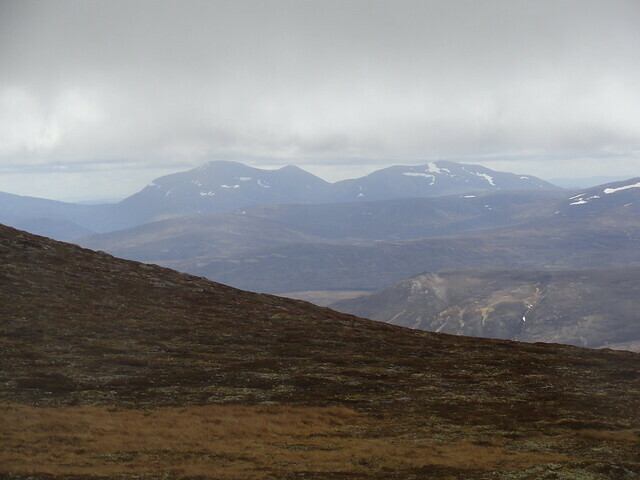 Above rose the mass of Devils' Point and the mighty Cairn Toul, its eastern corries still clad in snow, and its summit in cloud with occasional glimpses of its concave summit. 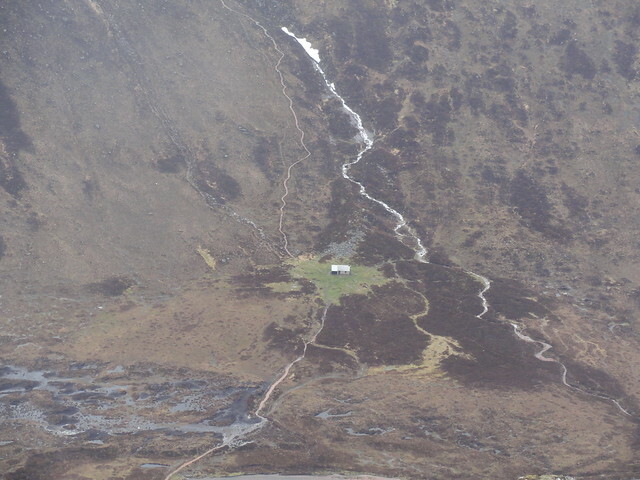 Further south, Glen Geusachan breached a gap between Devil's Point and the northern buttress of Beinn Bhrotainn. Spooky! 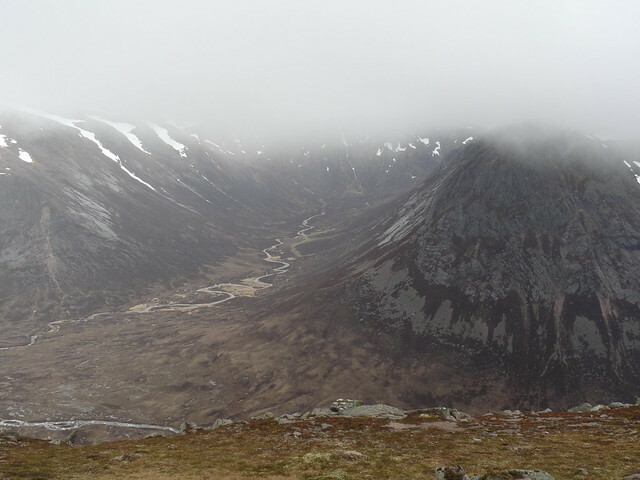 Occasionally I could peer quite far up the Lairig Ghru and a swirl in the clouds allowed me a brief glimpse of Braeriach. To my north, Ben Macdui, its upper slopes completely covered in snow, was hidden and only made the briefest of appearance. 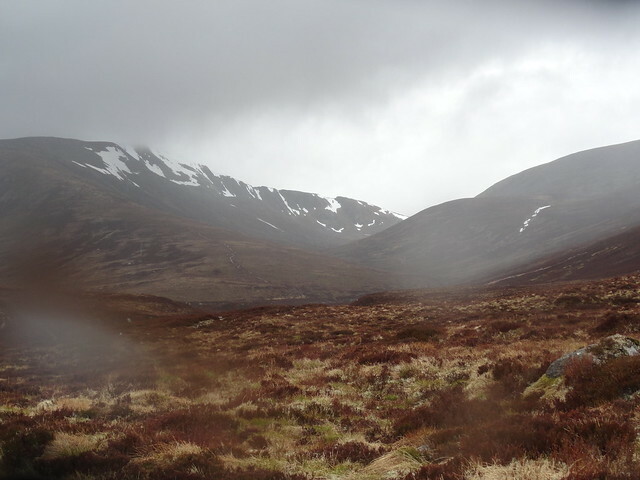 My camera lens was getting steamed up but I kept clicking away at this gloomy but strangely beautiful landscape. 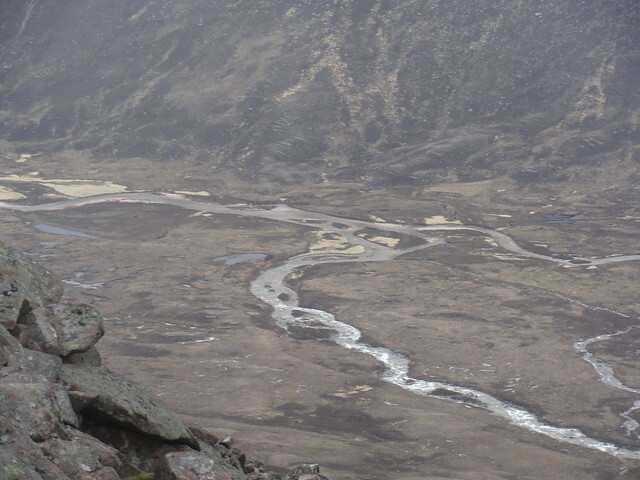 As I was reaching the bealach at the foot of Ben Macdui I saw a group of 3 people coming down and I gave them a quick wave as I started descending into the glen of the Allt carn a'Mhaim. 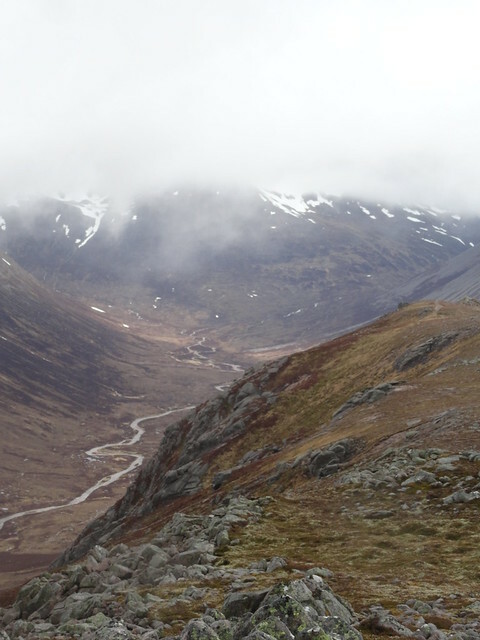 I picked my way down heather, grass and a stone chute from Sron Riach. 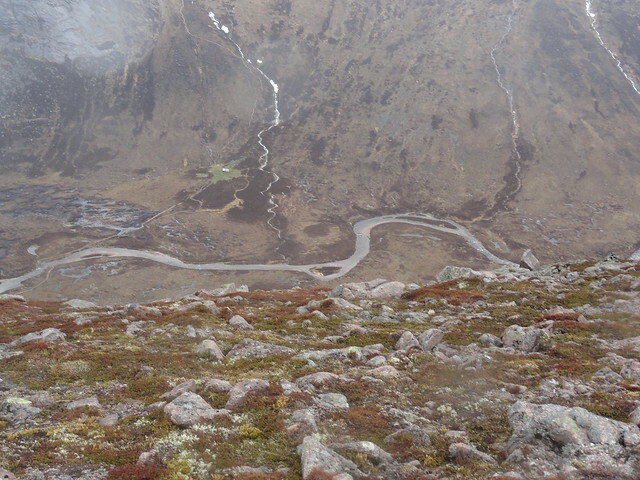 Happily a path appeared - I didn't expect it as this is not the normal return route from Ben Macdui. But I didn't complain and sauntered more easily down to the ford across the burn that comes down from Lochan Uaine (which I have yet to see). 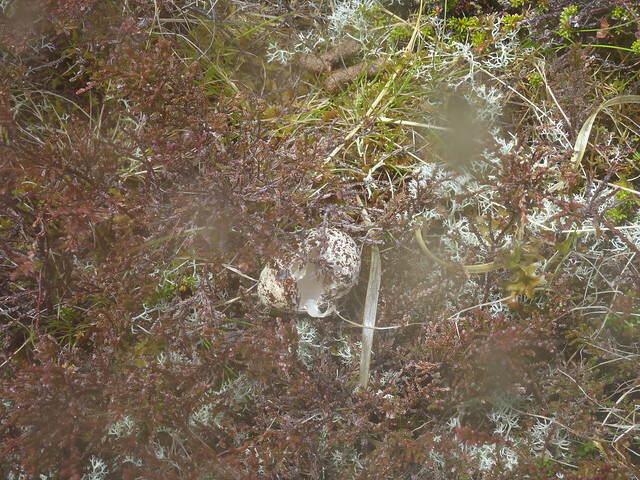 On the way, I found an empty grouse egg, clearly the aftermath of a plunder by a predator and later as I rejoined the path that comes from Srong Riach, I inadvertently disturbed a family of grouse. The familiar but always sudden cackling and beating of wings made me jump, and I just caught sight of both parents and 3 chicks running away, leaving a fourth one, stuck in place, panting with stress as I approached it to take a closer look. 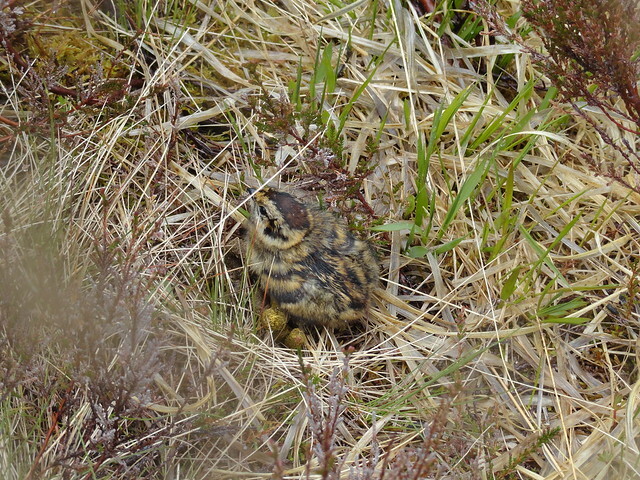 I took only a couple of pics and left quickly, hoping its parents would find it again to protect it from predators. Fingers crossed. I was back at the bike in no time and was about to settle down to a well earned cuppa and biscuit before the last ride to the car park when it started to rain quite heavily. In disgust, I swallowed the last of my caramel wafer (dark chocolate), stowed by sticks away in my rucksack and got in the saddle. 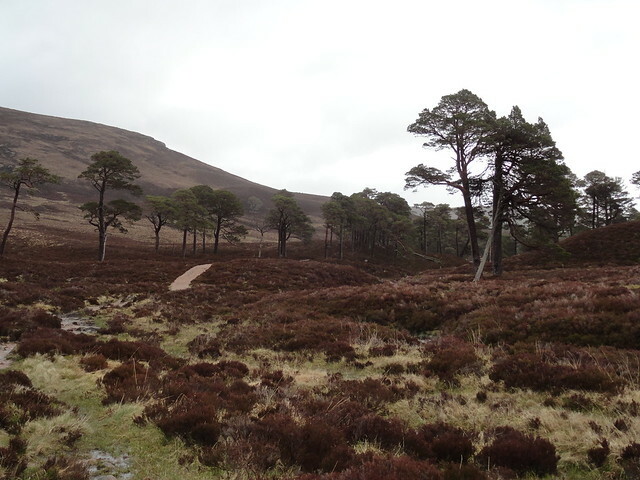 The three I had seen on the bealach were only 100 yards behind me but without the benefit of wheels, they were left behind whilst I whizzed down the path back to the bog. I decided to take the path on the right past the empty white house, hoping that it would eventually join up with the path to the bridge. But no So rather than lug the bike across peat hags back to the bridge, I just forded the Derry burn and got my boots and socks properly wet. 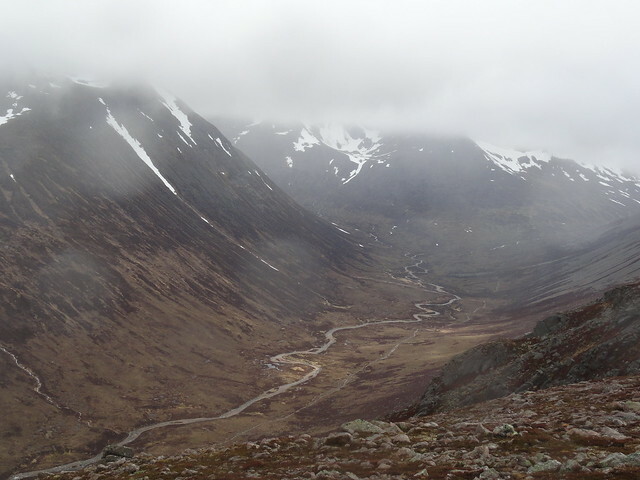 Ignoring the slushing of water around my feet, I just headed back down Glen Lui and the car park. It took my boots 3 days to dry out! 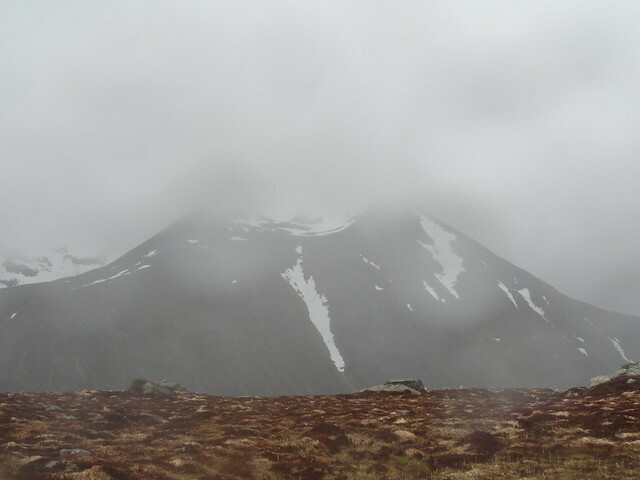 One last comment - I got back to Braemar at 4.25pm. I parked my car by the toilets in search of a nice cup of tea. One of the cafes was already shut. And I was turned back from the other one as I was walking up the ramp because it shuts at 4.30pm. So beware, Braemar shuts at 4.30pm on a Sunday. The Fife Arms Hotel is closed for refurb until 2017 and the status of the chippy is unclear. I didn't try the outdoor store. The caf at Glenshee shuts at 5pm.